2014 Topps Series 2 Baseball continues from where Series 1 left off. Filling in the checklist with more stars, rookies, as well as players in new uniforms, there's a lot of tradition behind the brand. 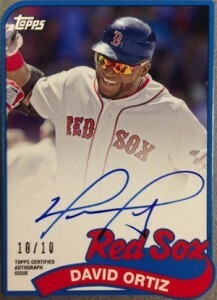 With the promise of one autograph or relic card per box, it's also very much in the modern realm. 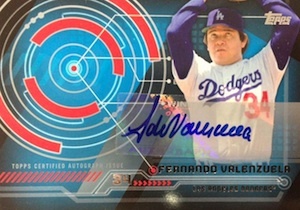 The 2014 Topps Series 2 base set adds another 330 cards. Numbering continues from where Series 1 ended. 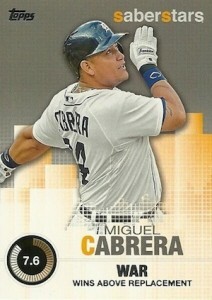 In addition to regular player cards, collectors can also find subsets for Future Stars, highlights and 2013 award winners. The parallel rainbow is big. Red Hot Foil cards land 1:6 hobby packs and one per jumbo pack. Gold cards are numbered to 2014. Others include Green Camo (#/99), Black(#/63), Pink (#/50), Printing Plates, and Platinum (1/1). Clear parallels done on acetate stock are numbered to 10 and can only be found in hobby packs, not jumbo packs. 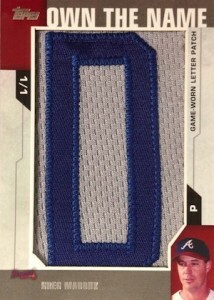 Silk Collection (#/50) is a partial parallel highlighting 100 players. Variations fall under several themes. Returning from Series 1 are Future Stars but with a slight twist. Variations show players in their Futures Game jerseys. Sparkles are also back. New variation themes include Sabermetric Stats, which have the same photo but a different set of statistics on the back, and a Joe Mauer card with Snoopy. 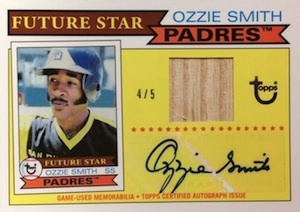 2014 Topps Series 2 Baseball sticks with the theme of "The Future Is Now!" for many inserts. This means a strong focus on rookies, young players and spotlights on great early careers from the past. 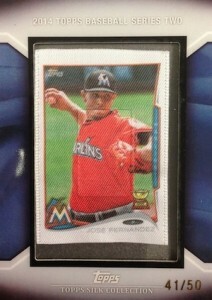 The Future Is Now inserts (25 cards, 1:4 packs) look at baseball's fresh faces. The set also has 30 Autographs (#/25), 30 Relics (#/99) and 30 Autographed Relics (#/10). 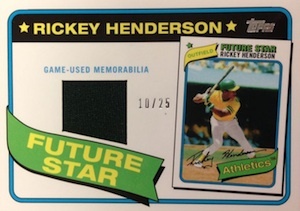 Future Stars That Never Were (30 cards, 1:18 packs) creates retro-themed cards for players who never appeared in a Future Stars subset. Although it's one of the most recognized names in the brand's history, it hasn't been used much in recent years. Gold parallels are numbered to 99. Fifteen autographed versions are numbered to 10. There are also 25 Relics numbered to 25 and ten Autographed Relics numbered to 5. All Future Stars That Never Were cards are exclusive to hobby and jumbo packs. 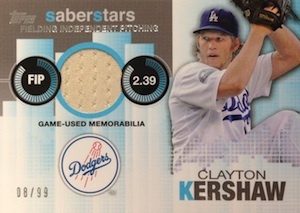 Saber Stars (25 cards, 1:8 packs) is an inserted set dedicated to the art of Sabermetrics stats. The checklist focuses on the top players as far as these deep numbers go. These also come with Autographs (ten cards, #/50), Relics (ten cards, #/99) and Autographed Relics (ten cards, #/25). Trajectory Autographs (40 cards) track players' progress from their rookie year through to the present. There is also a Gold version that's limited to 10 numbered copies. Trajectory Relics follow a similar format, only with pieces of equipment instead of signatures. These also have a Gold parallel (#/10). 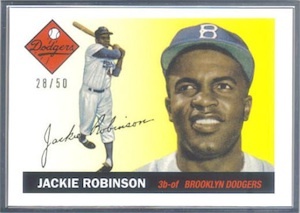 Jackie Robinson is the subject of a set of Framed Cards. These come in three versions: Black Frame, Silver Frame (#/50) and Gold Frame (#/10). Framed Topps Gold Label Cards use the 2000 Topps Gold Label design as its starting point. Numbered to 25, the set features active players and stars from the past. 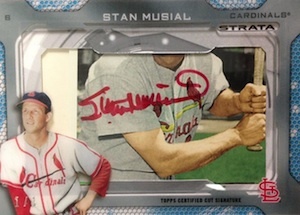 Framed cards combine to land one per hobby or jumbo case. 1989 Topps Mini Die-Cut cards bring back the Junk Wax design and give it a twist. Ten players have signed versions. Numbered to 10, these have on-card autographs. The set also has 15 relic cards, each numbered to 25. The shadow box-styled Strata cards return as a rare hit. Strata Signature Relics (25 cards, #/25) have a memorabilia piece on the bottom and a signed piece of acetate over top. The end result is a 3-D layered look. The checklist includes current and retired players. Thirty one-of-one Strata Cut Signatures are also randomly inserted. Own the Game Relics feature the letters from the backs of game-used jerseys. While each is a one-of-one, there are more than 500 different cards. 2014 Topps Series 2 Baseball cuts back on the number of manufactured relic sets. Class Rings is the lone one. 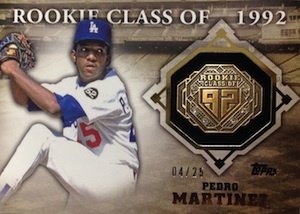 These cards come with a manufactured ring embedded in the card and highlight the featured player's rookie year. Base versions of the 25-card set are done in silver. 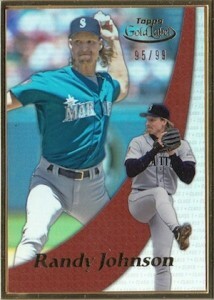 Parallels include Gold (#/99) and Gold Gems (#/25), which come with replica jewels. Ten players also have Gold Gems Autographs versions that are numbered to 10. Class Rings combine to fall one per hobby case or one per jumbo box. The Power Players parallel code program continues with 55 more players including 2014 rookies. 330 cards. Shop for complete sets on eBay. The list is a work in progress. View our detailed guide, with images, here. 100 cards. Inserted 1:232 hobby packs. 15 cards. Inserted 1:9,765 hobby packs. 10 cards. Inserted 1:37,000 hobby packs. 25 cards. Inserted 1:1,050 hobby packs. 10 cards. Inserted 1:11,500 hobby packs. 5 cards. Inserted 1:2,844 hobby packs. 25 cards. Inserted 1:575 hobby packs. 25 cards. Inserted 1:1,848 hobby packs. 15 cards. Inserted 1:1:7,724 hobby packs. 10 cards. Inserted 1:23,525 hobby packs. Serial Numbered 1/1. Inserted 1:2,320 hobby packs. 10 cards. Inserted 1:3,697 hobby packs. 10 cards. Inserted 1:7,290 hobby packs. 10 cards. Inserted 1:4,620 hobby packs. 25 cards. Inserted 1:1,850 hobby packs. 30 cards. Inserted 1:1,232 hobby packs. 30 cards. Inserted 1:4,880 hobby packs. 30 cards. Inserted 1:3,862 hobby packs. 32 cards. Inserted 1:51 hobby packs. 55 cards. Inserted 1:2,625 hobby packs. 41 cards. Inserted 1:585 hobby packs. Good: Great continuity from Series 1, tight focus, inserts aren’t as over-powering as they have been in recent years, better chance at premium hits. Bad: Way too many variation themes. The Bottom Line: The set builder in me is very pleased with 2014 Topps Series 2. It’s reasonably priced, offers lots of info, has a decent checklist and can be built in a basic form. My biggest issue is with the variations. They’re overdone. For me, one major theme is enough. Two is debatable. Three jumps the proverbial shark. But in the grand scheme of things, this is a small part of the overall product and something that can be skipped for those who aren’t into them. This is a tighter set than other flagship sets in recent years. And while big autographs and memorabilia cards are still a long shot, they do appear to be landing noticeably more frequently. 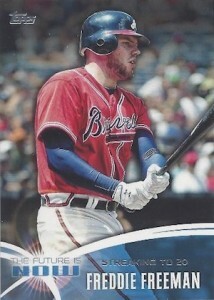 I like the 2014 Topps base design a lot. Had it not been for several straight years of white borders it would probably stand out even more. It’s clean and understated in a good way. There are lots of interesting photos and plenty of information. A lot of the inserts are a carryover from Series 1 so those who collected them know what to expect. The Future Is Now is one of the more interesting basic inserts. They use filtered photos and a big bottom nameplate that makes for a tight look. However, the cheesy captions on the front have the exact opposite effect. Future Stars that Never Were is a bit odd. 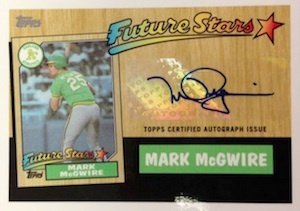 They’re essentially a reprint of an old-school rookie with an addition of a hypothetical “Future Stars” notation. The idea is to fill in the years where the subset didn’t exist. Using a new photo here would have gone a long way here, especially since so many of these have been recycled as other inserts over the last few years. I understand using the thick card stock is intended to give them a more premium feel, but they’re rooted in nostalgia so it doesn’t really add much. The 1989 Die-Cut Minis are something of a disappointment. Part of this is Mini Fatigue. They seem to be everywhere in the last few years. The die-cuts here don’t add a lot either, particularly the nub on the bottom. 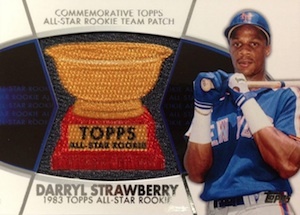 The biggest surprise in 2014 Topps Series 2 Baseball might just be the Trajectory Jumbo Relics. The quality of these relics look more like something out of a high-end brand. And numbered to 99, they’re not exceptionally rare either. As a basic insert, Trajectory was okay. But the circular relic windows look fantastic. Add to that, a good amount of the cards have patches and premium swatches. As a continuation of Series 1, I have no complaints. It does a great job of filling out the biggest parts of the rosters. Sure, the set builder in me would like something a little bigger, but 330 cards for one series is solid. 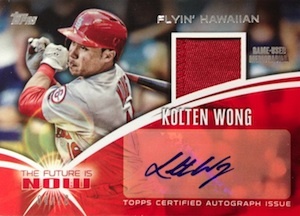 Base Topps isn’t normally the place to chase major hits. Although the odds are still very long, there does seem to be more than usual. The player selection isn’t the strongest, but it’s understandable and fair given this isn’t a high-end release. My gripe is the variations. At this point, they’re out of control. When they started in earnest a few years ago, there was one theme and maybe a single card or two. They were based on themes and usually very distinct. Even if you weren’t a fan, you could keep up with them. 2014 Topps Series 2 is up to three themes plus a straggler Snoopy card. There are well over 100 variations in this series alone. Add to that, half of them come from Series 1 cards. The straw to my camel are the sparkles. They’re incredibly tough to spot and don’t add anything other than being rare. To me, rare for rarity’s sake isn’t compelling. Variations are at a tipping point and I think it’s time to bring it back to basics. If they’re going to exist, find a single theme that’s exciting and makes collectors want to chase them. That said, I think there’s some great potential for the Sabermetric Stats variations. They’re interesting but I want to see them switch to a parallel. Spread the concept across the entire set. Do so by keeping them relatively easy to collect. I’d start with the Gold parallels. Adding the different stats would make it a wholly different set and maybe inject some new-life into the long-running (and pretty stale) parallel. 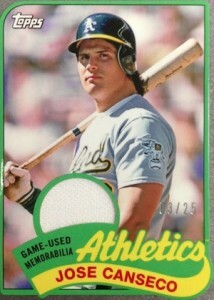 Topps did something similar in 1995 where they included parallels that predicted stats had the 1994 not been cut short. This is base Topps, not a hits factory. To me, the value comes with spending a reasonable amount on a big stack of cards and sorting through them. I always seem to land the plainest jersey card and that’s okay. Most of the time it’s the first card I forget about because I don’t bust flagship for hits. I like sorting, building, studying and just collecting it. Even if you’re not building the set, it’s the kind of product you can buy a handful of packs and see lots of variety. To that end, 2014 Topps Series 2 works just fine. Whether you’re going the hobby box route or retail, the cost of 2014 Topps Series 2 isn’t all that high. Like every flagship set, the fun comes in sorting through everything and taking a closer look at the players, photos and themes. This year feels a lot less bloated than the last couple of years. The result is something that’s, overall, tighter and more fun. Matt Holliday JUMBO RELIC! 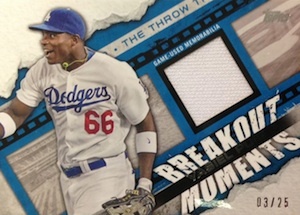 2014 Topps Trajectory Jumbo Relic! #33 99! Cardinals! 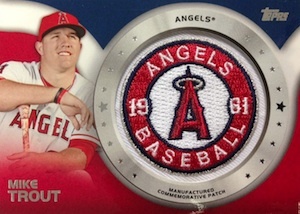 2014 Topps MIKE TROUT Trajectory Jumbo ANGELS Jersey Relic #29 99 PSA 9 Mint!! 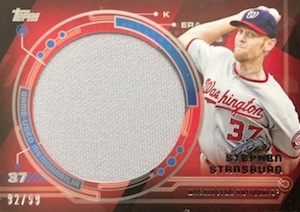 So is this 2014 topps baseball or 2014 topps strata baseball? Still don’t see avisail garcia in this set what’s up with that?? Stuff looks like junk, series 1 was much better. Series I May look like a familiar friend, however the box break of series II I just watched might of opened the gate to put Series I out to pasture. “Junk”? OK . I’d say more like the Topps Echo Chamber repeating trends over and over again. The what I would call higher end inserts are nearly unattainable to the average set builder. How about current players only for Series I & II Seems like as a new collector after 30 yrs that Heritage or Archives is a perfect fit for baseballs elite and our heroes. Overall I think it’s a budget product with an almost higher end look and feel. Buy a pack. GREAT product this year! The photos used are awesome this year. Overall box value is strong, as there are plenty of inserts, hits, etc. that can recoup funds. I suggest everyone tries a box, especially a Jumbo hobby!! Question – did anyone else pull brown/copper parallels? I think these are supposed to be the yellow retail parallels, as they are not limited print. I just opened a hobby box and was very impressed with the hits/inserts I received. Scored a nice silk card, a patch card, couple of the “should of” future stars, and a lot of color variations including a pink. Very much so worth the price! For the price this is a great set. I am watching my 9 year old learn how to collect and love baseball the same way I did. If it was not for a product like this, how would children learn about this great hobby? They don’t have the money for the high end stuff, Topps is smart to keep this product priced to a point where kids can collect! Beautiful cards. I was wondering If anybody knew where I could find a, “PP-131 Adam Eaton – Chicago White Sox” ? Thanks! Color parallels and especially the new stat variations are a waste of cards and just annoying. I will call this a 3.5 rating; slightly above average, but not excellent. Pictures are well selected and the design of the card is pleasing, and fun to collect, but a bit bland. The card pictures have inconsistent quality printing, which seems unacceptable in this day in age. 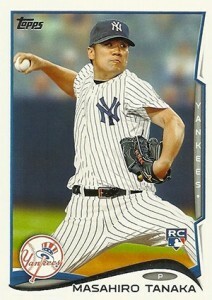 I feel there are too many random inserts and variations, and Topps would be better off making a more complete set. Collecting Topps of the past, even when the quality was lower than the competitors at times, was still fun because of the larger completeness of the set that put you in touch with the game itself, learning about the game as you collect in addition to the players themselves. Keep the auto’s and relics, that is really neat, despite me not getting a single one accept on ebay. Then, I would go back to the 792 card set, adding; team cards with the team checklist, All-Star game player cards with an all star game wrap up card given it’s importance to the season, and more highlights of the season that took place like key plays, games and bloopers. How about a card that explains all the crazy statistics, and cards for the AL/NL League championships. 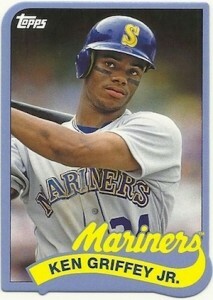 Completing a Topps set always had a huge sense of accomplishment, even if the factory set was just around the corner. I have just picked up collecting again with my son after some 24 years away, and am surprised how the base Topps set has regressed to this very basic set. This is only my opinion, but my experience was from 1978-1990, a period of huge change. I loved every year getting more exciting, even if the cards were becoming less valuable during this time. Today, the current configuration and price has me just wanting to wait for the factory set to come out, and buy any variations I want off ebay, because it only focuses on players, and isn’t too exciting to put together given the checklist and card configuration. I do understand that the industry has changed, but I can’t help but wish for something like the 800 card and gorgeous Upper Deck sets met with the above recommendations. Maybe Topps needs some competition to help streamline and improve their products putting them more in touch with the market and consumer, or maybe I’m missing something. I think I found a way to determine if you have a SP card. The MLBPA logo in the bottom right on the back of the card is replaced with the Cooperstown Collection logo. I noticed this yesterday as my #629 Cliff Lee was the only card that had the Cooperstown logo in the entire retail box I opened. Please confirm. This page does not list it, but there is also a purple Toys-R-Us parallel on Series 2 (just as there was on Series 1). 1st Kris Bryant rookie card available? Maybe so. This product will sell here in chicago that’s for sure.